Spend your afternoons relaxing on the covered patio, or take a walk in the nearby park. Want to live nestled in the trees in Central Austin? Enjoy the beautiful Hancock Ranch House in a safe, established neighborhood. 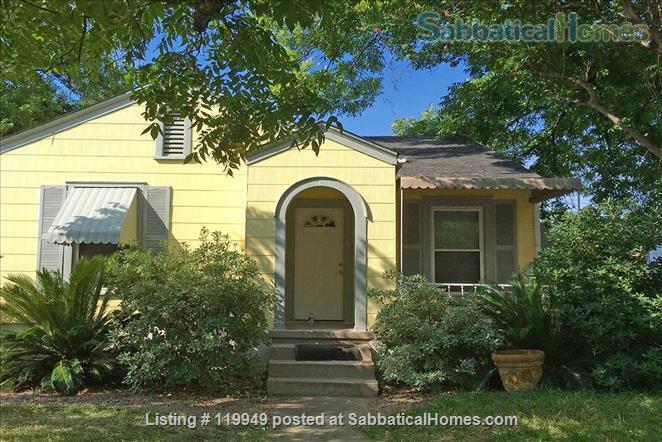 This beautiful home is situated in Allandale in the Shoal Creek area, a tranquil neighborhood with quiet, tree-lined streets. The 2300 square foot Hancock Ranch House features 3 bedrooms and 2 bathrooms, with an open floor plan and an abundance of natural light. Have extra guests? Add on the Petite Suite to create a space with a total of 4 bedrooms and 3 bathrooms. The Hancock Ranch House includes two flat-screen TVs with DVD and Wi-Fi. Prefer monthly stays or academic terms. I’m rachel nation, and I live online yet savor my moments offline. I love a design challenge and am obsessed with details. I'm also a lifelong student. I thrive on anything home-related. Home is where you create memories gathering with family and friends. I’m passionate about being a Mom of incredibly happy twin girls and meeting interesting people from around the world through our Hancock Guest Cottages Austin vacation rentals. Conceived in Austin, spent my childhood in Houston and am back to Austin again for 25+ years. You might find me in hiking in West Texas or kayaking and sailing at the lake in my downtime. We have enjoyed hosting visiting professors, families, and grad students from England, Scotland, Germany, Mexico, and from around the States including Brown, Rice, Yale, UT and many other places.